Article from the “Gazeta Finansowa” from October 17th-23rd, 2008. "Gazeta Finansowa" is the main financial weekly in Poland. There has been an abundance of investment hints in recent days. The present proposals look more like attempts to regain confidence tarnished by earlier offers, in particular concerning TFI (Investment Funds Societies) products. Now the recipients of the advice are supposed to have the impression, that professional advisers are still busy and finding attractive solutions. It is assumed that investors have rather short memories and will entrust their money again to the same managers. An alternative attitude is to assume that, in difficult times, cash is king and that it is not worth taking any action whatsoever. This strategy has one main benefit – it distances itself from the products offered by investment managers. At the same time it also benefits banks. Lack of confidence in the financial sector results in a desperate search for cash from banks own depositors in order to finance credit action – banks vie with one another in offering attractive deposit rates. This situation should compel us into thinking whether we are not dealing with another sheep-like stampede. Inflation is “eating up” our savings, though. The Icelandic Krone lost tens of percent of its value overnight. As can be seen, cash is not always king, of which the citizens of Iceland can assure us. Is there no possibility of making a reasonable investment in our curious times? A reasonable investor is able to multiply assets – moreover, he can increase the value of his investment at a relatively much faster rate than during a steady growth trend. The terms crisis, slump are as a rule, synonyms of losses – that is, by definition the majority of investors will lose, otherwise we would have a boom. Most managers, by definition, will also generate losses for their clients in the slump period. One needs to remain vigilant. A good strategy is having many strategies, at best without a common part, that is, as highly diversified as possible. A fundamental analysis is helpful during a slump to determine the relative value of companies, industries, raw materials and currencies. Instead of applying the “cash is king” principle, it is better to compose individual structures, which one can optimize and manage in due time. The present way of preventing a crisis does not guarantee cash as a safe investment. Certainly, one can use this strategy as one of many. Because the only good strategy is to have many strategies and it is on this principle that a well managed investment fund, as well as by a well run personal portfolio should be based. Investment funds which manage the entrusted capital are recognisable by the fruits of their labour. It is somewhat strange that out of all Polish investment fund ranges there were none which would multiply member’s profits during the slump. In the summer of 2007, when shares were drastically overvalued, managers were not aware of the situation. It is quite obvious that people stormed financial brokers’ offices during the height of the boom period. However, a conscious investment manager should take capital (its profit) and instead of buying shares should occupy short positions on the market (dependent also on the profile and fund strategy) and in the worst case should hold on to cash. As can be seen, the sheep-like stampede among managers has lead to colossal losses for members. Perhaps it would be a good idea to revise the competence examinations for investment advisers while investment portfolio should be run solely by persons proven to have successfully managed their own savings. PKO BP is in many ways better prepared to face a downturn in the economy than other banks. Due to this advantage, companies and individuals alike, are choosing PKO BP, as a safe bank and by doing so are increasing the bank’s advantage and security. At present it is worth considering buying PKO BP shares while at the same time adopting opposite positions (short sales) on the remaining banks. Why? Despite recent growths the slump is here to stay for a while. Even if drastic falls were not to be repeated, the aversion to risk taking will remain and will manifest itself in the selection of the investment portfolio. The crash on the stock exchange is, in a way, of a “virtual” nature. In the real world the slump will appear in a few weeks or months. When the recession arrives, companies, including banks, will experience it. 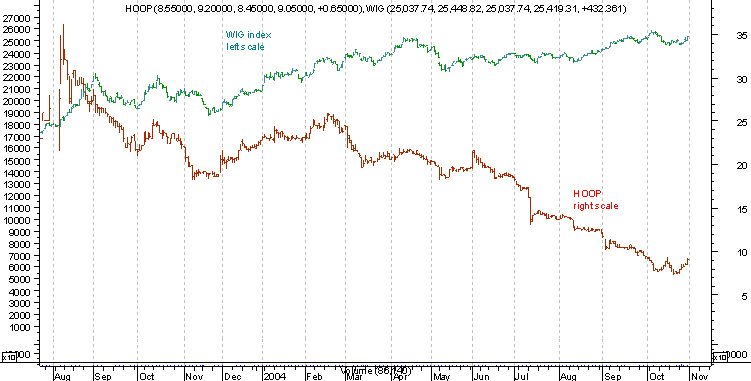 The present drop in share prices is nothing but the discounting of future events. The financial system is struggling with a lack of confidence and the maintenance of a shaken international liquidity. In a few months time the real economy will reveal what today the decision makers who manage bank assets approximate in their decisions about propensity to lending money. While financing their long term credit positions banks cover them with their short and medium term liabilities towards depositors and may experience substantial difficulties. If the National Bank of Poland steps forward with a relief package, it will only serve to improve the banks liquidity. However, the financial results of the banks with toxic assets can be disastrous. It is obvious that those banks who have applied an aggressive credit policy will find themselves in a very disadvantageous situation. PKO BP is on the other side of the extreme – they have stuck to a conservative credit model. PKO BP is a bank with no strategic foreign shareholder. The American and European banks applied a more aggressive policy than Polish banks, thus their financial results will be more affected by the crisis situation. Polish banks, which possess a foreign owner, are exposed to the risk that their parent company will drag the dependant companies down – despite the fact that these are separate entities the transfer of capital both in a direct and indirect way from the dependant company to the parent company is possible. Large companies which are more exposed to the effects of collapse of a bank than individuals, are aware of the deteriorating situation in the banking sector. Many companies are now moving their accounts from other banks to PKO BP. Individuals, including those who have above average savings, are also spotting that, in case of a crisis, PKO BP’s position is much better in comparison to other banks, and are also moving their deposits to PKO BP. PKO BP has its own strong depositor’s base – which in the present situation is priceless! Older persons, who value security of deposits more than the high interest rate associated with higher risk, constitute a major percentage of the bank’s clients. Of importance is also the psychological attachment of customers to the bank, the “PKO” logo has its own proven value. In future, the bank will not have to seek a dramatic increase in interest rate on deposits in order to attract/keep its depositors. Thus, due to having lower financing costs the bank has real grounds to expect relatively better financial results than other banks. Considering the above assumptions the strategy of buying PKO BP shares looks attractive while at the same time selling shares of other banks for same amount – occupying short positions on shares of the remaining banks on WSE allowed short sales. One can also simplify the strategy – it will however be a departure from the above assumptions, i.e. instead of occupying short positions on a couple of banks, the investor can occupy short position on WIG20 contracts – where the banking sector constitutes a substantial part of the index. It is highly probable that the strategy presented above will bring profit to the investor. Moreover, one can expect an increase of profits if the market falls – this strategy is aimed at exactly such a situation. Should a growth trend appear or a horizontal one, the solution presented ensures more probability of profit than probable loss over the next weeks/months. The PKO BP share purchase strategy vs. the Bank Index presented on October 17th, 2008 in the Gazeta Finansowa [Financial News] weekly has proven to be very accurate. PKO BP gained in relation to the index around 10 percentage points up to 20.11.2008, as shown by the chart. One can find several dozen materials relating to Jaroslaw Suplacz, who is in charge of PolandSecurities, in the mainstream Polish media, including a few cover stories. The most influential journal in Poland is the "Gazeta Wyborcza", the main financial weekly – "Gazeta Finansowa", the main Polish financial journal – "Rzeczpospolita", the biggest journal dedicated to the stock market - "Parkiet" and many others. Artykuły prasowe w języku polskim dotyczące raportu PolandSecurities ukazały się we wszystkich dziennikach finansowych. Najobszerniejsze materiały można znaleźć w archiwach Gazety Wyborczej, Parkietu, Rzeczpospolitej, szukając keywords: Supłacz, Poland Securities. The original report regarding HOOP S.A. IPO was developed in 2003. A related quotation from the www.bankrupt.com service reads: “Based in Warsaw, Poland, Hoop S.A. produces fruit-flavored carbonated beverages, cola, and mineral water. Its original schedule for an IPO was foiled after Jaroslaw Suplacz, an independent analyst, published a report via the Internet valuing the company at less than PLN 5 per share, well below other analysts' expectations of PLN 26 per share. He also suggested that Hoop's existing shareholders might be guilty of stripping the company of assets, and that the company was on the verge of bankruptcy.” Articles about my report hit first pages of all the Polish financial newspapers, with the HOOP IPO being the largest on the Polish market in 2003. Here is the link to a chart with HOOP quotations. ITI: Wpływy z oferty niższe od kosztów? Z sondażu przeprowadzonego wczoraj w biurach maklerskich wynika, że oferta sprzedaży akcji ITI Holdings S.A. cieszyła się "umiarkowanym" zainteresowaniem inwestorów. Wtorek był ostatnim dniem zapisów na te walory. Zdaniem przedstawicieli biur maklerskich potencjalnych nabywców zniechęca przede wszystkim wysoka cena ustalona przez spółkę w przedziale o 9,75-14 zł za akcję. Dodatkowym argumentem przeciw zakupowi mogą być wyceny opublikowane przez biura maklerskie. Najwyżej walory ITI wycenił IDM Kredyt Banku na 9,72 zł. Wycena opublikowana przez CA IB określająca wartość akcji ITI na 13,85 przyjmowana jest przez większość analityków i inwestorów z nieufnością ponieważ instytucja ta pełni rolę współmenedżera oferty. Zainteresowanie akcjami ITI określiłbym jako umiarkowane. W opinii wielu naszych klientów akcje są drogie - powiedział Piotr Duszek, naczelnik wydziału rynku pierwotnego w BDM PKO BP. Podobnie określił popyt na walory ITI Piotr Teleon z CDM Pekao S.A. Jego zdaniem spadki kursów na giełdzie zniechęcają inwestorów indywidualnych również do zakupu papierów ITI. Z nieoficjalnych informacji uzyskanych przez PG wynika również, że od zakupu akcji ITI powstrzymały się największe instytucje finansowe. Podejrzewam, że oferta ITI zakończy się fiaskiem, a wpływy z emisji mogą się okazać niższe od kosztów jej zorganizowania, które zgodnie z zapisami prospektu emisyjnego mają się zamknąć gigantyczną kwotą 10-17 mln USD - powiedział Jarosław Supłacz, analityk niezależny, autor niezwykle krytycznego raportu na temat oferty ITI. W swoim opracowaniu Supłacz wycenił akcje ITI na zaledwie 0,40 zł. Należy odnotować możliwość emisji akcji przez ITI do wysokości kapitału autoryzowanego w wielkości 1,5 mld akcji (przy aktualnej liczbie 160 mln akcji). Taki zapis dyskwalifikuje ofertę w oczach funduszy inwestycyjnych. Ile na świecie jest spółek dopuszczonych do publicznego obrotu, które pozostawiają zarządom możliwość prawie 10 krotnego! zwiększenia kapitału akcyjnego na warunkach jakie zarząd uzna za stosowne? - pyta Jarosław Supłacz. Uważa on, że na "ratunkowy" zakup akcji mogą się zdecydować jedynie instytucje finansowe powiązane z BRE Bankiem, głównym kredytodawcą ITI i akcjonariuszem posiadający 15,25 proc. akcji gdyż bez nowej emisji ITI nie będzie w stanie w krótkim czasie spłacać swoich zobowiązań.